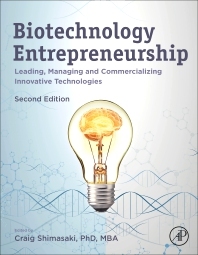 Biotechnology Entrepreneurship and Management: Leading, Managing and Commercializing Innovative Technologies, Second Edition presents the authoritative guide to biotechnology enterprise and entrepreneurship, thus supporting the international community in training the biotechnology leaders of tomorrow. Outlining fundamental concepts vital to graduate students and practitioners entering the biotech industry in management or in any entrepreneurial capacity, the book provides tested strategies and hard-won lessons from a leading board of educators and practitioners. It is an essential ‘how-to’ for anyone training for the biotech industry, from macro-to-micro. Coverage ranges from the initial challenge of translating a technology idea into a working business case, securing angel investment, and managing all aspects of the result, including business valuation, business development, partnering, biological manufacturing, FDA approvals and regulatory requirements. Finally, this new edition includes insightful stories from successful entrepreneurs and new figures to help further explain concepts. Contains new chapters on "Understanding and Negotiating a Term Sheet" and "Planning your Company Exit Strategy"
1. What is Biotechnology Entrepreneurship? 21. How to Value Your Company and What is it Worth?